Luigi Ferrarese (December 12, 1795 – August 8, 1855) was an Italian physician and the leading proponent of phrenology in Italy in the Nineteenth Century, who advocated for a government embrace of phrenology as a scientific means of conquering many social ills in his Memorie Risguardanti La Dottrina Frenologica (1838). Ferrarese describing pandeism in Memorie Risguardanti la Dottrina Frenologica ("Thoughts Regarding the Doctrine of Phrenology", 1838), p. 16. George Combe (1845) "A Visit to Dr Ferrarese of Naples", The Phrenological Journal, and Magazine of Moral Science, , p. 139. Even Italy sends forth her testimony that phrenology has reached her shores. 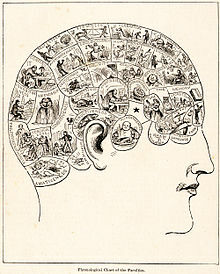 On my return from America in June last, I found awaiting me a little work entitled' Memoirs regarding the Doctrine of Phrenology and other Sciences connected with it,' by Dr Luigi Ferrarese, Professor of Medicine in Naples, read before the Royal Academy of Sciences in that city. It was published with full permission from the royal censor of the press. The censor in his report on the work certifies that it ' is very instructive and useful, and contains nothing offensive to religion or to the rights of kings. I found him in circumstances which indicated much depression, both physical and mental. He spoke with interest of Phrenology, and said that he had projected a Phrenological Journal, but knew that he would be stopped by the Government. He wished to shew the importance of the science in insanity, criminal legislation, education, and social arrangements; but in Naples there was no outlet for knowledge. Altogether, I have never had an interview with any phrenologist, foreign or British, who excited so strong a feeling of sympathy and regret, mingled with respect for his intellectual acquirements, as did Dr Ferrarese. On 10th February 1839, he commenced a periodical, named "Il Gatto Letterato, Foglio periodico," dated in Capolago (a town in Italian Switzerland), but printed at Naples (without licence); and for a "Lettera di un Frenologo ad un Dottore degli Stati Pontifici" (" Letter from a Phrenologist to a Doctor in the Papal States"), he was called before the Santa Sede (Holy Tribunal); and afterwards, in 1840, for several other articles, he was seized and imprisoned for 28 days. He was suspended from his office of physician in ordinary to the Royal Lunatic Asylum at Aversa, and crushed to the earth by every engine of persecution which bigotry and tyranny, combined, could employ against Him. This page was last edited on 17 December 2017, at 15:06.